A short explanation for a term is also displayed when you move the mouse cursor on a link to an article in the list. The page with article article categories helps you to find more articles on a certain topical area. You should also check out the Photonics Spotlight and the RP Software News, which you can receive as e-mail newsletters! On this page you find all our encyclopedia articles on keywords beginning with "B". Indented lines indicate articles on related topics. Further below, you find the acronyms. Spotlight 2008-03-04: What is a ''high'' laser beam quality? Spotlight 2007-07-11: What is a beam width, beam size, and a beam waist? Spotlight 2007-09-01: Stimulated Brillouin scattering: lower peak power, stronger effect? 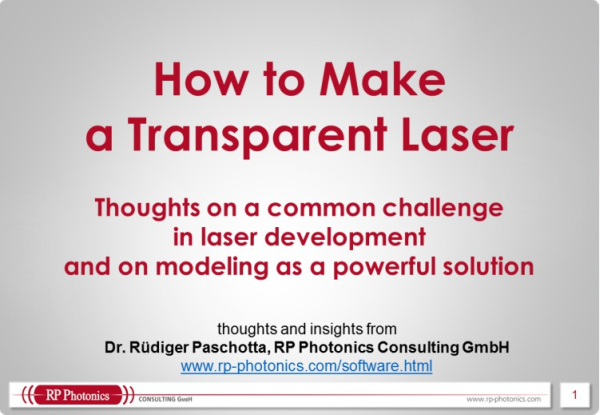 … and if you need any more help on such topics, consider to use the consulting services of RP Photonics Consulting GmbH! There is a variety of various services available in topical areas such as lasers, amplifiers, nonlinear optics, fiber optics, ultrashort pulses, multilayer mirrors, noise and fluctuations, and other topics in photonics and optoelectronics.